Reading and share top 17 famous quotes and sayings about Vagaries by famous authors and people. Browse top 17 famous quotes and sayings about Vagaries by most favorite authors. 1. "You do not seem aware, for all of your knowledge of the great world I do not frequent, of the usual response which the productions of the Female Pen--let alone as in our case, the *hypothetick* productions--are greeted with. The best we may hope is--oh, it is excellently done--*for a woman. * And then there are Subjects we may not treat--things we may not know...We are not mere candleholders to virtuous thoughts--mere chalices of Purity--we think and feel, aye and *read*--which seems not to shock *you* in us, in me, though I have concealed from many the extent of my--vicarious--knowledge of human vagaries. Now--if there is a reason for my persistence in this correspondence--it is this very unawareness in you--real or assumed--of what a woman must be supposed to be capable of. This is to me--like a strong Bush, well-rooted is to the grasp of one falling down a precipice--here I hold--here I am stayed--"
2. "A little rain, a little blood. Black fingernails in August; and going berserk, going bananas. As if entrapped in a tropical heatwave, with dozens of whirlwinds swirling in one's mind, one thinks of a way out, or a way in: out of the scorching bosom of a volcano, and in – into the centre of a raging hurricane. And tracing the labyrinthine ways of your mind, the haphazard vagaries of your thoughts at ease, the odds and ends of your mental surplus you carelessly throw at the world, one wants to be at a loss, in a maze; amazed, and amazingly unabashed." 3. "Every adult life could be said to be defined by two great love stories. The first - the story of our quest for sexual love - is well known and well charted, its vagaries form the staple of music and literature, it is socially accepted and celebrated. 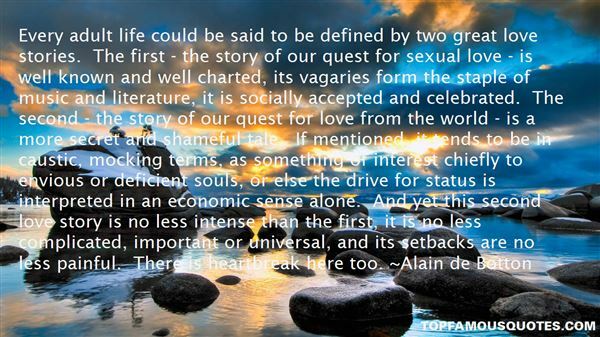 The second - the story of our quest for love from the world - is a more secret and shameful tale. If mentioned, it tends to be in caustic, mocking terms, as something of interest chiefly to envious or deficient souls, or else the drive for status is interpreted in an economic sense alone. And yet this second love story is no less intense than the first, it is no less complicated, important or universal, and its setbacks are no less painful. There is heartbreak here too." 4. "To muse for long unwearied hours with my attention riveted to some frivolous device upon the margin, or in the typography of a book — to become absorbed for the better part of a summer's day in a quaint shadow falling aslant upon the tapestry, or upon the floor — to lose myself for an entire night in watching the steady flame of a lamp, or the embers of a fire — to dream away whole days over the perfume of a flower — to repeat monotonously some common word, until the sound, by dint of frequent repetition, ceased to convey any idea whatever to the mind — to lose all sense of motion or physical existence in a state of absolute bodily quiescence long and obstinately persevered in — Such were a few of the most common and least pernicious vagaries induced by a condition of the mental faculties, not, indeed, altogether unparalleled, but certainly bidding defiance to any thing like analysis or explanation." 5. "Eccentricity is not, as some would believe, a form of madness. It is often a kind of innocent pride, and the man of genius and the aristocrat are frequently regarded as eccentrics because genius and aristocrat are entirely unafraid of and uninfluenced by the opinions and vagaries of the crowd." 6. "Mathematics, natural science, laws, arts, even morality, etc. do not completely fill the soul; there is always a space left over reserved for pure and speculative reason, the emptiness of which prompts us to seek in vagaries, buffooneries, and mysticism for what seems to be employment and entertainment, but what actually is mere pastime undertaken in order to deaden the troublesome voice of reason, which, in accordance with its nature, requires something that can satisfy it and does not merely subserve other ends or the interests of our inclinations." 7. "...no matter how rhapsodic one waxes about the process of wresting edible plants and tamed animals from the sprawling vagaries of nature, there's a timeless, unwavering truth espoused by those who worked the land for ages: no matter how responsible agriculture is, it is essentially about achieving the lesser of evils. To work the land is to change the land, to shape it to benefit one species over another, and thus necessarily to tame what is wild. Our task should be to delivery our blows gently." 8. "They changed their minds, Flew off, and into strange vagaries fell." 9. "But what is the sense in forever speculating what might have happened had such and such a moment turned out differently? One could presumably drive oneself to distraction in this way. In any case, while it is all very well to talk of 'turning points', one can surely only recognize such moments in retrospect. Naturally, when one looks back to such instances today, they may indeed take the appearance of being crucial, precious moments in one's life; but of course, at the time, this was not the impression one had. Rather, it was as though one had available a never-ending number of days, months, years in which to sort out the vagaries of one's relationship with Miss Kenton; an infinite number of further opportunities in which to remedy the effect of this or that misunderstanding. There was surely nothing to indicate at the time that such evidently small incidents would render whole dreams forever irredeemable." 10. "A hundred years or more, she's bent her crownin storm, in sun, in moonsplashed midnight breeze.surviving all the random vagariesof this harsh world. A dense - twigged veil drifts downfrom crown along her trunk - mourning slow woodthat rustles tattered, in a hint of windthis January dusk, cloudy, purplingthe ground with sudden shadows. How she broods -you speculate - on dark surprise and loss,alone these many years, despondent, bent,her bolt-cracked mate transformed to splinters, moss.Though not alone, you feel the sadness of atwilight breeze. There's never enough love;the widow nods to you. Her branches moan." 11. "Love of my life. Love. Of. My. Life. A retrospectively absurd concept since the most I can say is that he was the love of a particular period of my life, and that it is the random vagaries of life itself, and never love, that define time limits. Meaning, to be in love and wish for its immortality is energy unwisely spent. The idea that we have any choice in the matter is the great illusion." 12. "Death is a release from the impressions of the senses, and from desires that make us their puppets, and from the vagaries of the mind, and from the hard service of the flesh." 13. "High among the unpredictable variables that endanger the survival of worthy buildings are the vagaries of taste." 14. "Oh my God!" said one of the Ambers. "Is this not the worst trip ever? Did you see the snow?" She was a sharp one, this Amber. What would she notice next? The train? The moon? The hilarious vagaries of human existence? Her own head?" 15. "When he at least reached the door the handle had cease to vibrate. Lowering himself suddenly to his knees he placed his head and the vagaries of his left eye (which was for ever trying to dash up and down the vertical surface of the door), he was able by dint of concentration to observe, within three inches of his keyholed eye, an eye which was not his, being not only of a different colour to his own iron marble, but being, which is more convincing, on the other side of the door." 16. "This party will not take its position based on public opinion polls. We will not take a stand based on focus groups. 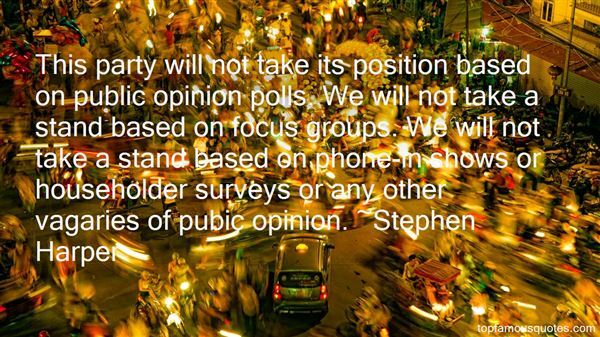 We will not take a stand based on phone-in shows or householder surveys or any other vagaries of pubic opinion." 17. "The train swung around the curve, the engine puffing with short, heavy blasts, and they passed smoothly from sight that way, with that quality about them of shabby and timeless patience, of static serenity: that blending of childlike and ready incompetence and paradoxical reliability that tends and protects them it loves out of all reason and robs them steadily and evades responsibility and obligations by means too barefaced to be called subterfuge even and is taken in theft or evasion with only that frank and spontaneous admiration for the victor which a gentleman feels for anyone who beats him in a fair contest, and withal a fond and unflagging tolerance for whitefolk's vagaries like that of a grandparent for unpredictable and troublesome children, which I had forgotten." Que gente! Que coisas! Que opiniões! Que vida! Sinto entre mim e o meu país a distância abismosa deste sentimento: o desprezo. (...) O silêncio é a única resposta possível."